Running a WordPress site comes with multiple security risks you need to manage somehow. One of the biggest threats comes from untested themes and plugins created by third-party authors. 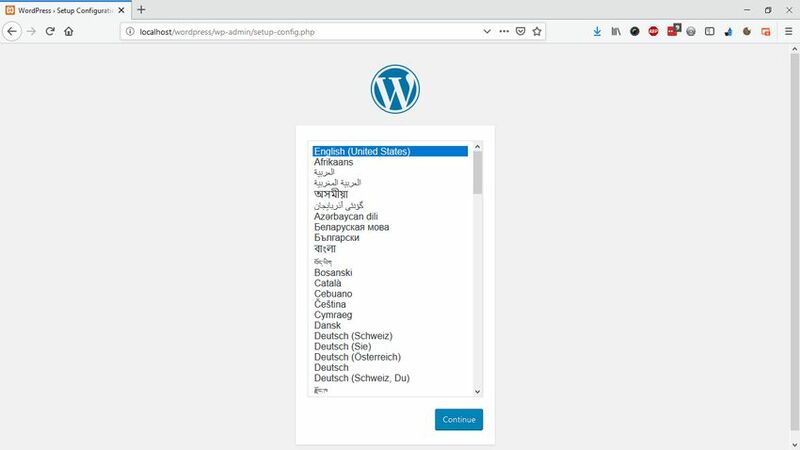 To make sure you don’t install a plugin or theme that breaks your WordPress site, the best thing you can do is to test it in a local environment before activating it on your production site. X: refers to XAMPP’s cross-platform nature; it runs on all major operating systems: Windows, Linux, and Mac OS. XAMPP is not only good for WordPress development but any kind of web development that requires a PHP and/or Perl-enabled web server. In this guide, we will look into how to use XAMPP to set up a local WordPress environment on Windows. 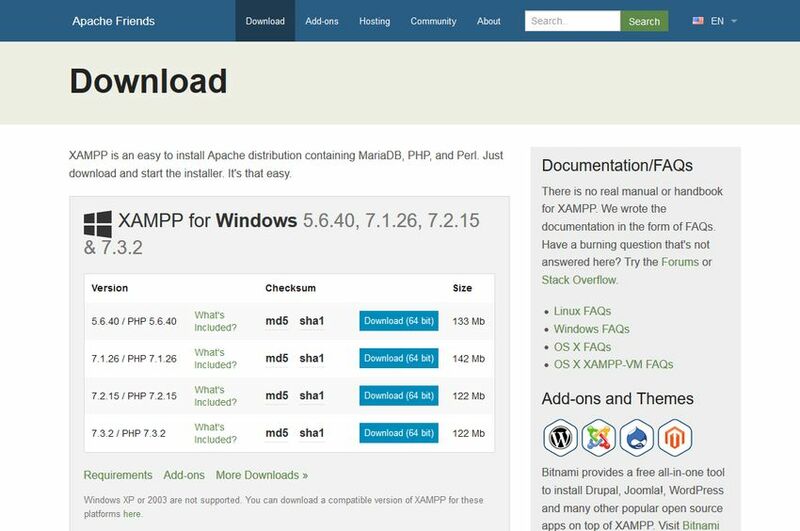 You can download XAMPP right from Apache Friends’ homepage. Click the XAMPP for Windows option and save the installer to your computer. On the homepage, the default Windows installer is based on the latest PHP version (currently, PHP 7.3). However, if your production WordPress site runs on an older version of PHP (i.e. 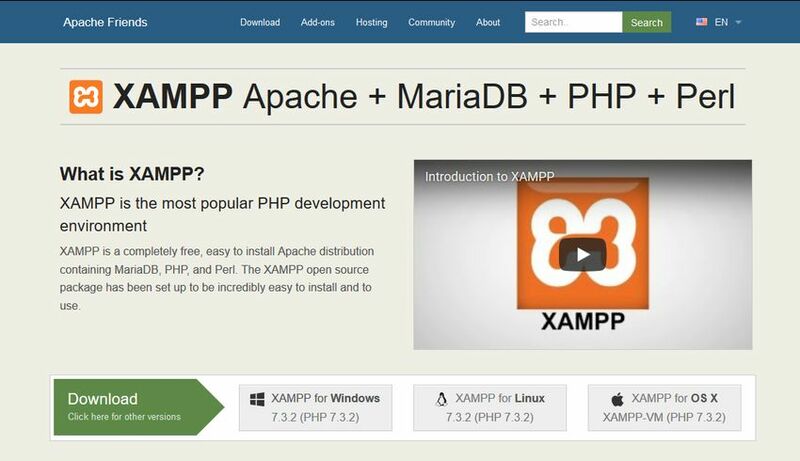 PHP 5.x), go to the Download page and download the XAMPP version bundled with PHP 5.x. This way your local and production environments will be more or less in sync. Start the installer by clicking the .exe file. It will ask you to select the components you need. Besides the compulsory components you can’t opt out from (Apache and PHP), you need to select MySQL and phpMyAdmin to create a local WordPress install. Opt out from the rest. 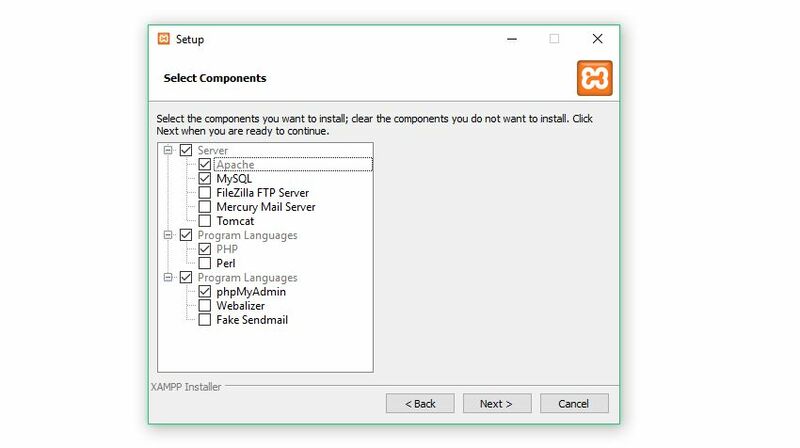 Go through the installation process and when it’s done, start your XAMPP web server. You will find a little orange XAMPP icon in the taskbar, next to the date/time and language settings. Right-click the icon and click the Show / Hide option that will make your XAMPP Control Panel appear on the screen. 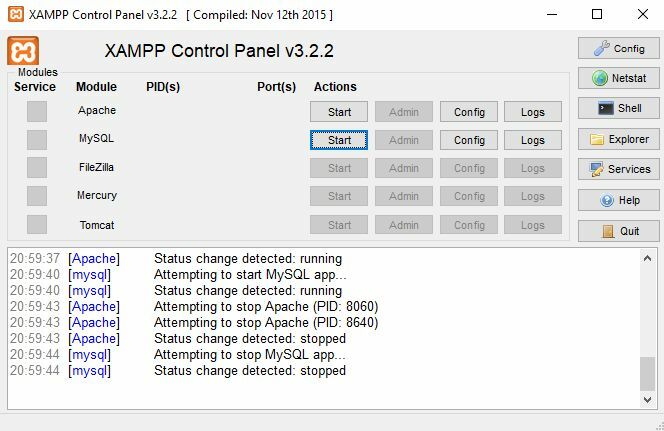 In your XAMPP Control Panel, you need to start two modules: Apache and MySQL. Click the Start buttons next to the modules’ names and wait until XAMPP notifies you that they are properly running. Now, your local web server is up and running. To test it, type localhost into the URL bar of your browser and check out if you can see the “Welcome to XAMPP” screen. If yes, XAMPP runs properly on your machine and you can start creating your local WordPress environment. Go to the Download page at WordPress.org and download WordPress. Ideally, you should download the freshest WordPress release. However, if your production site uses an older WordPress version, you can also download the same release you use online. Many plugins and themes behave differently on different WordPress versions, so you should aim to make your local environment as similar to your production environment as possible. You can find older WordPress versions on the Releases page. Save your local WordPress install to the /xampp/htdocs folder on your computer. If you have installed XAMPP without modifying the settings you can find the /xampp folder on your main hard drive (usually C:/xampp). Extract the ZIP file and move the inner wordpress folder one level up. The default path of your local WordPress install should be /xampp/wordpress. You can also rename your WordPress folder if you want, for instance you can use the /xampp/test-site name. 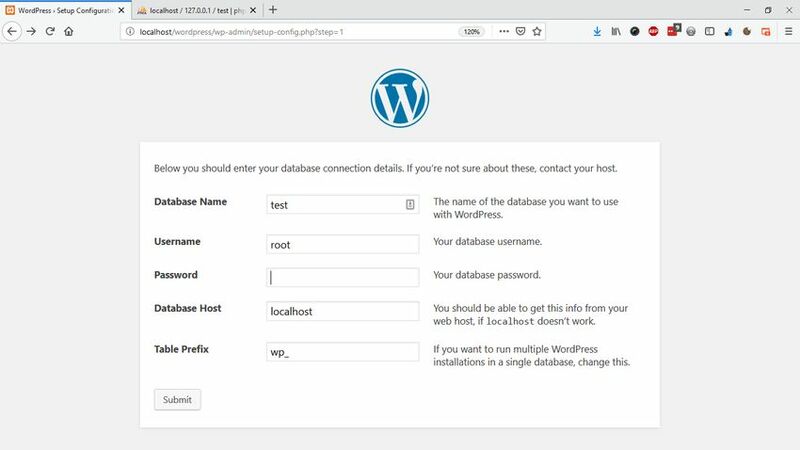 Before you run the WordPress installer, you need to create a database for your WordPress site using the phpMyAdmin database management software. As you have installed it together with XAMPP, you can find it by typing localhost/phpMyAdmin into the address bar of your browser. Inside phpMyAdmin, click the Databases menu in the top menu bar and create a new database. I’ll use the “test” database name in the example, however, you can use any other name. You also need to choose the character encoding from a dropdown list. Here, choose utf8_general_ci. When your new database is done, it will appear in the left sidebar of phpMyAdmin. Your database will be empty at the moment. It will be populated with data by the WordPress installer in the next step. 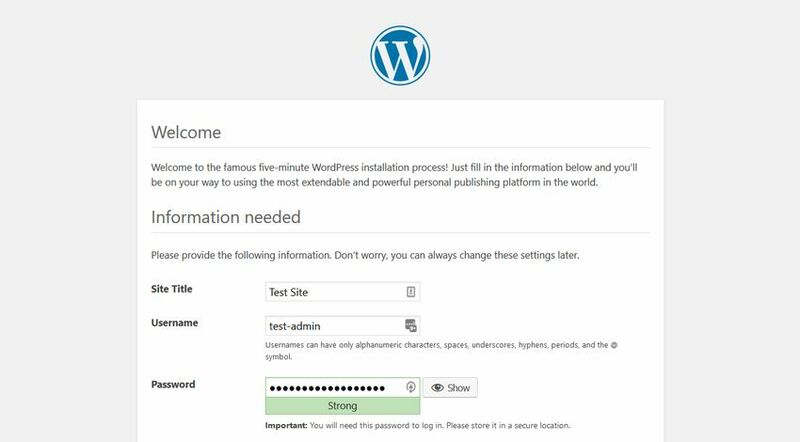 Now, start the WordPress installer at localhost/wordpress and go step-by-step through the installation process. Fill in the setup form with the data WordPress requires. Your database name will be the same you have created inside phpMyAdmin (test in the example above). The username will be root, leave the password field empty, and the database host will be localhost. If you want to use a more secure table prefix you can change the default wp_ prefix. You can also opt for the same table prefix you use on your production site. Submit the form and run the WordPress installer. It will ask a couple of questions related to your WordPress site such as the name of your site, a WordPress admin username (different from the phpMyAdmin username), and others. You need to choose a password with at least medium strength (you can see the evaluation below the password field), otherwise you can’t run the installer. For security reasons, never use the admin username on a production site. Although it doesn’t really matter in a local environment, it’s better to keep up the good practice. 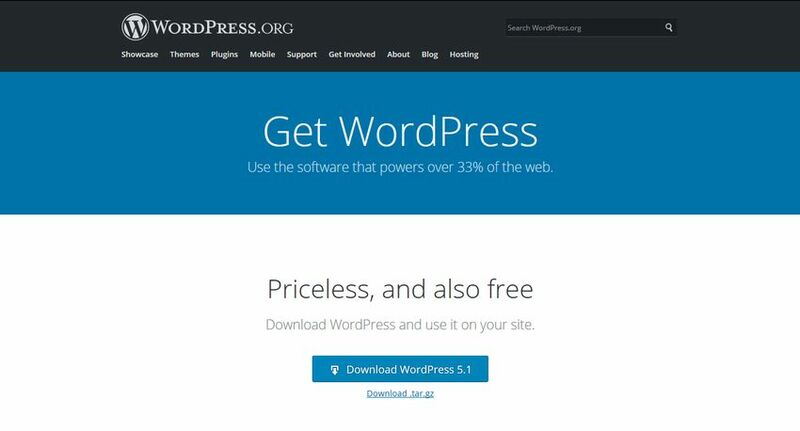 Click the Install WordPress button at the bottom of the screen. The installation process will take a couple of seconds (sometimes 1-2 minutes). When it’s done, you will get a notification and you can log in to your local WordPress site. You can find your local site at the localhost/wordpress URL and the admin area at localhost/wordpress/wp-admin. Whenever you want to use your local WordPress environment, you need to start XAMPP and access your site at this URL. To test the site, log in with the username and password you chose during the installation process. You can also check your database in phpMyAdmin. Now, the database you’ve created is populated with WordPress-related tables. 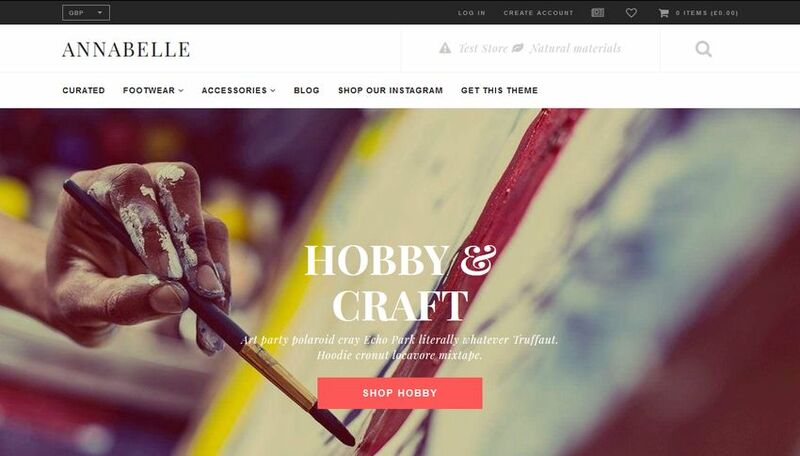 Having a local WordPress environment can be quite helpful, as you can test different themes and plugins before using them on your production site. 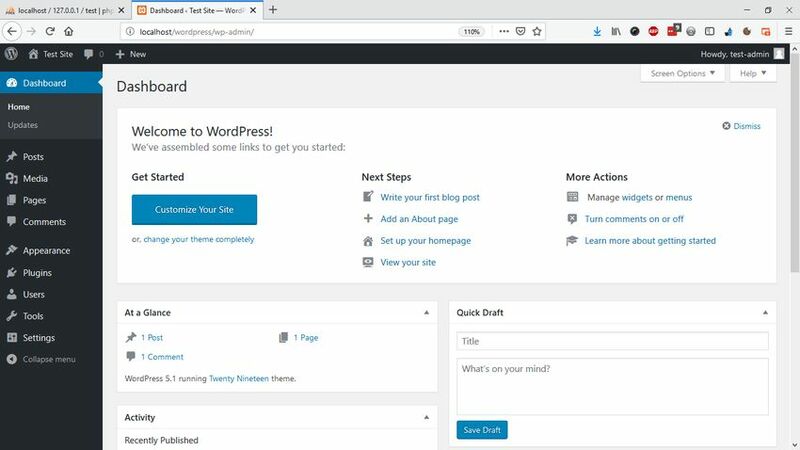 It can also come in handy if you want to get started with WordPress development, even if you just want to add a couple of lines of code to your theme’s functions.php file. 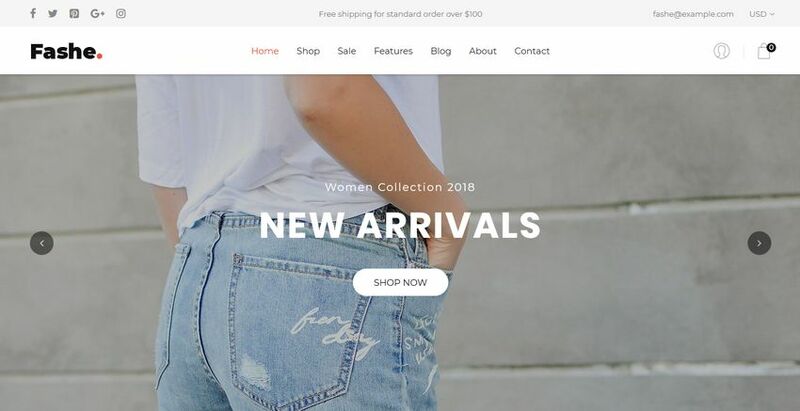 To learn more about WordPress basics, also have a look at our article about how to create a child theme or our 5-step guide to optimizing your WordPress site. Bootstrap 4 is currently the most popular front-end framework in the world. 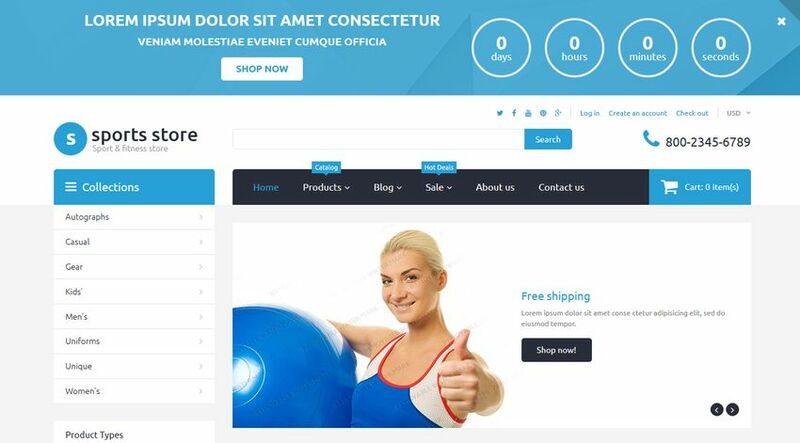 You can use it to build any kind of user interfaces, from admin templates to full-featured websites. 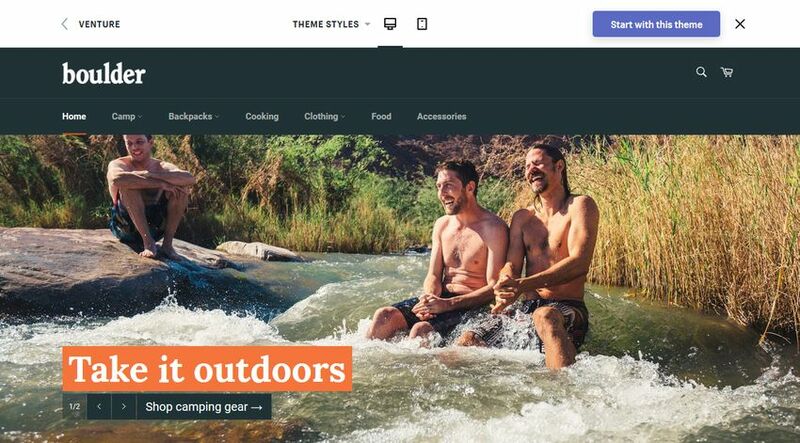 In this step-by-step tutorial, we will have a look at how to build a responsive landing page with Bootstrap 4. 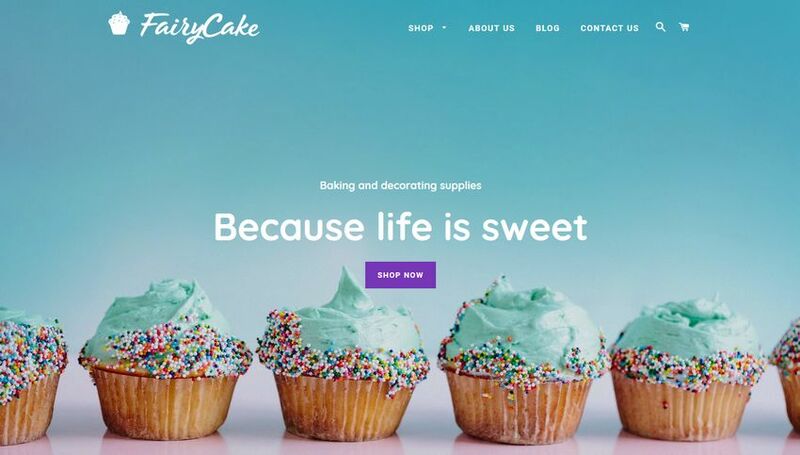 You can even use it as a homepage or connect it to a specific marketing campaign. The most important thing to know about Bootstrap 4 is that it has a utility class for almost everything. For instance, they have .bg-light (see above) that adds a light background and .bg-dark that adds a dark background to any HTML element. With Bootstrap 4, you can prototype your designs by barely touching any CSS code. 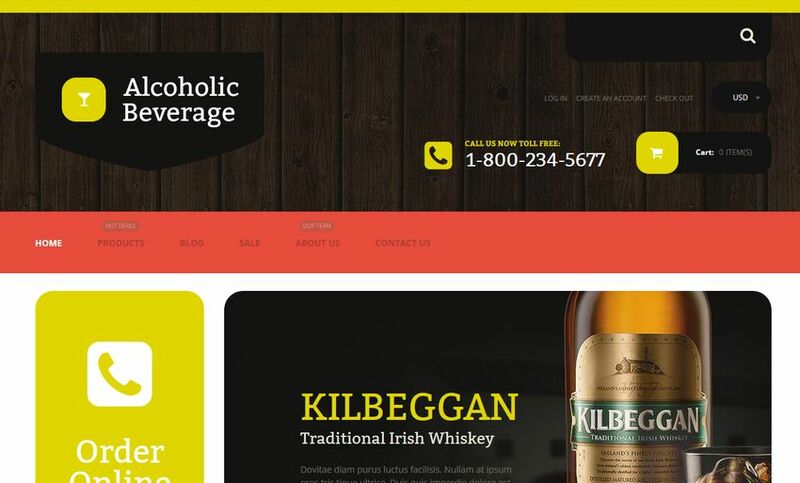 However, as the .fixed-top class fixes the navigation bar to the top, you need to make some extra space for it. So, add the following rule to your custom style.css file. Or, if you don’t want a fixed navigation bar, simply omit the .fixed-top class from your HTML code. If you want a full-width hero section, use the .container-fluid and .jumbotron-fluid classes. If you don’t want it to span the whole viewport, use .container and .jumbotron instead (see detailed explanation in the Jumbotron docs). The code above also makes use of Bootstrap 4’s .display-3 and .lead typography classes and the .text-center text alignment class. Besides, it adds bottom padding to the lead text by using the .pb-4 class. If you want to use other margin and padding sizes check out how Bootstrap 4’s spacing classes work. For instance, the .pb-4 class adds the padding-bottom: 1.5rem !important; rule to any HTML element. 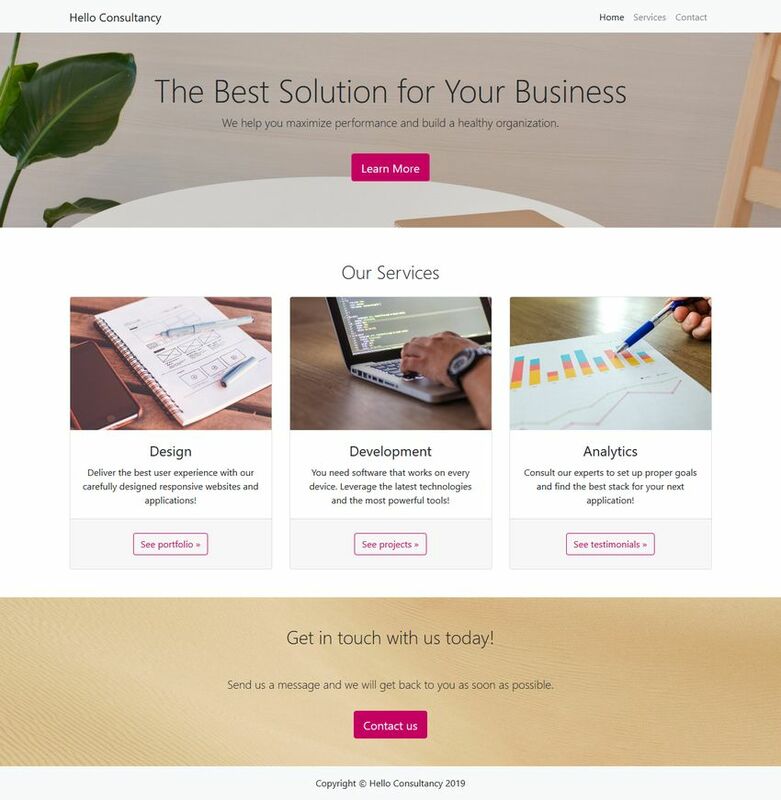 To create a three-column Services section, use Bootstrap 4’s responsive grid system consisting of rows and columns that divide up the screen. By default, every row contains 12 columns (however, you can change this in your Sass settings). You can indicate the number of columns you want to use within the name of the column class. For example, .col-4 takes up 4 columns out of the 12. Bootstrap 4 has five responsive breakpoints that define five grids: extra small (default), small, medium, large, and extra large. As the breakpoints are based on minimum width media queries, the column classes apply to their own grid and all the grids above. For instance, in the code below, .col-md-4 applies to the medium, large, and extra large grids. This means that tablets and desktops will display the Services section in 3 equal columns next to each other. And, smartphones with extra small and small viewports will display them below each other (one column per row). <p class="card-text">You need software that works on every device. 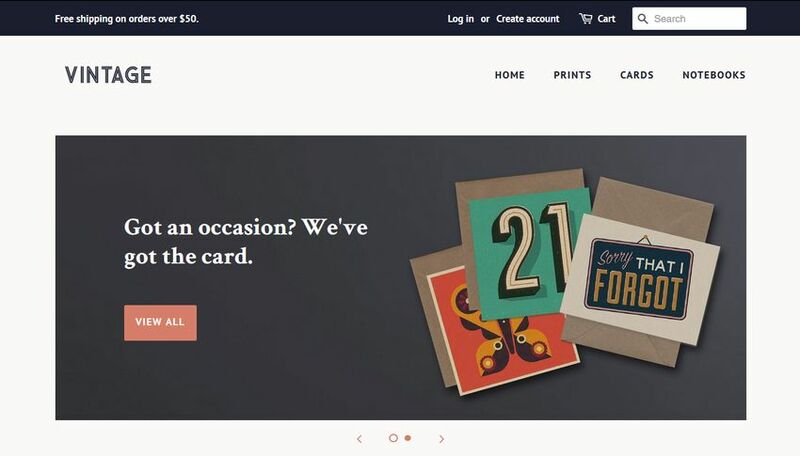 The code above also makes use of Bootstrap 4’s Card component that comes with five pre-built classes: .card, .card-img-top, .card-body, .card-title, and .card-text. The .h-100 class is one of Bootstrap 4’s sizing utility classes you can use on any element you want. It sets the height of each card to 100%. 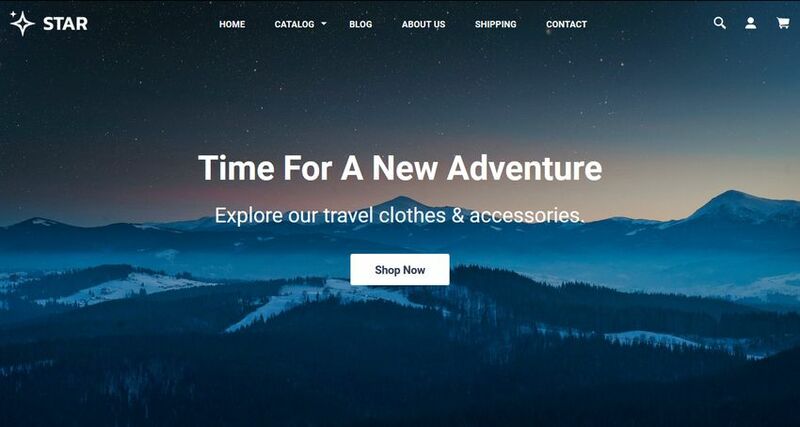 In this article, we have created a fairly simple landing page. In the real world, it would have other sections as well, such as key features, pricing tables, client logos, and testimonials. Using Bootstrap 4’s responsive grid system, you can easily create other column-based sections as well, similar to the Services section. Bootstrap 4 also has multiple pre-built components such as forms, modals, carousels, and more. Before you begin to add anything to your design, always check out the docs, as the Bootstrap team might have already built it for you. If you want to add a functioning Contact form to your landing page, you can use Google Forms to process the form in the backend. Besides Bootstrap 4, you can also create responsive landing pages with the CSS grid. To see how it works, have a look at our step-by-step guide of how to create a custom CSS grid. Create a new global variable for the date and time when the countdown will expire (endDate in the example). You can define its value by creating a new Date object and calling its getTime() method. The endDate variable will hold the expiry date in UTC format that shows the milliseconds since Jan 1, 1970, 00:00:00.000 GMT. For example, the UTC value of Mar 15, 2019, 12:00:00 is 1552647600000. Create another global variable for the timer. The example below uses a function expression, as this way you don’t have to call the function separately. However, if you want you can also declare it as a function statement. Inside the timer() function, define two new local variables. The first one (now) will return the current time and the other one (t) will calculate the remaining time. Create an if block that will hold the instructions belonging to the timer. This code will be executed every second until the remaining time is greater than zero. By using an if block, you don’t have to stop the timer when the countdown is over. First, you need to convert the remaining time into a usable format. Currently, it’s in UTC format, while you need to display it as days, hours, minutes, and seconds. So, declare four new local variables for the remaining days, hours, minutes, and seconds. Remaining days: Divide the UTC value by 1000 * 60 * 60 * 24 which is the number of milliseconds in a single day (milliseconds * seconds * minutes * hours). Remaining hours: Get the remainder of the previous calculation using the % remainder operator and divide it by the number of milliseconds in a single hour (1000 * 60 * 60 = milliseconds * seconds * minutes). Remaining minutes: Get the remaining minutes and divide it by the number of milliseconds in a single minute (1000 * 60 = milliseconds * seconds). Remaining seconds: Get the remaining seconds and divide it by the number of milliseconds in a single second (1000). Now that you have all the data in the right format, you can output the timer to the screen. The getElementById() method of the document object allows you to target the HTML elements you created in Step 1, respectively #timer-days, #timer-hours, #timer-mins, and #timer-secs. You can place content into the targeted HTML elements with the innerHTML property. The code above adds a “0” character to hours, minutes, and seconds when their values are less than 10. Although this is not necessary, the timer looks better when the number of digits doesn’t change all the time on the screen. This can be achieved with a formatting trick that makes use of the slice() method that can be used to return a portion of a data set. For instance, slice(1) slices off the first character of a string and returns the rest of the string. Similarly, slice(2) removes the first two characters and returns the rest. A negative value returns the targeted characters rather than slicing them off. So, slice(-2) returns the last two characters of a string. You can notify users when the countdown is over if you want. Create an else block and target the #timer element with the getElementById() method. You can add any text as innerHTML you want to display to users when the countdown expires. Alternatively, you can omit the entire else block, in which case the timer will simply disappear from the screen when the countdown is over. You can style the countdown timer any way you want. The CSS below uses flexbox to position it to the center of the screen both horizontally (with justify-content) and vertically (with align-items). There are multiple online learning platforms where you can learn how to code. Each adapts to different learning styles, so the most important thing is to find the one that best fits your own needs. In this article, we have collected 15 places where you can learn how to code in 2019. The platforms cover both client- and server-side programming languages and technologies. The prices are as of early 2019. However, they might change at any time, so always check out the latest fees before you make a decision. Learning materials include interactive coding lessons, articles, and video tutorials. 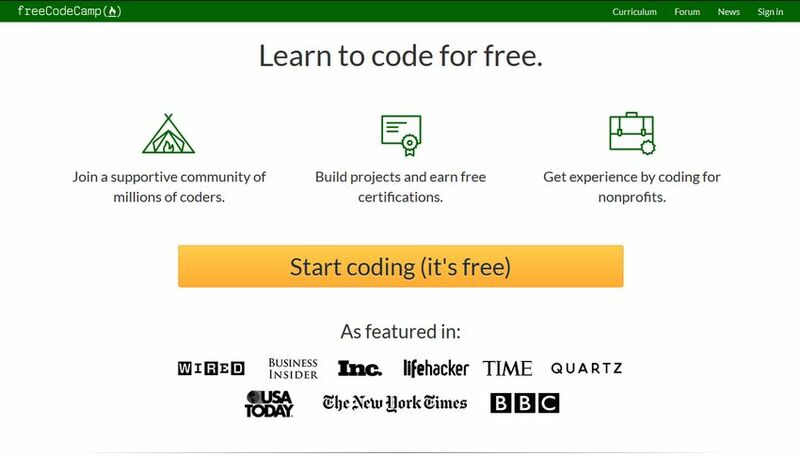 FreeCodeCamp also provides you with the opportunity to work together with non-profit organizations to get hands-on coding experience. Khan Academy is a non-profit organization that provides free education in many different fields, including computer programming, computer science, and computer animation (in collaboration with Pixar). The courses are made up of video lectures, coding challenges, and Q&A sections. Khan Academy also hosts Hour of Code, an e-learning website that teaches programming to children. The Odin Project is an open-source project created by volunteers with the aim to help beginners learn to code for free. The platform offers a complete learning path to become a full-stack Ruby on Rails developer. Beginners can also pick up some basics that most learning platforms don’t teach such as how the web works or how to use the command line. The Odin Project prepares students for job interviews by dedicating a full course to career advice, too. Coursera is a popular MOOC (Massive Open Online Courses) site where you can learn multiple subjects, including software development. Courses on Coursera are high-quality, as they have been created by top-notch universities around the world. You can even earn full university degrees in Computer Science, both on bachelor and master levels. Pricing: Free if you don’t want to earn a certificate. Otherwise, you pay on a course by course basis—the price depends on the publishing university. Financial aid is available in most courses. edX is a MOOC platform that hosts university-level programming courses, MicroMasters Programs, professional certificates, and online Master’s degrees. Besides universities, you can also find edX courses created by industry leaders such as Microsoft and W3C. edX courses center around online video lectures but they also contain articles, examples, and exercises—depending on the course. Pricing: Without earning a certificate, it’s free. Verified certificates start from $49.00 per course. W3Schools is a free online tutorial site where you can learn both client-side and server-side technologies. It’s not related to W3C, although they both started on Tim Berners-Lee’s World Wide Web in the late 90s. You can follow the tutorials step by step and test the examples using a built-in code editor. W3Schools also has a less well-known “Exercises” section. The UI is not very nice or intuitive but you can use it to quickly pick up the basics of a programming language for free. Codecademy allows you to follow structured learning paths at your own pace. 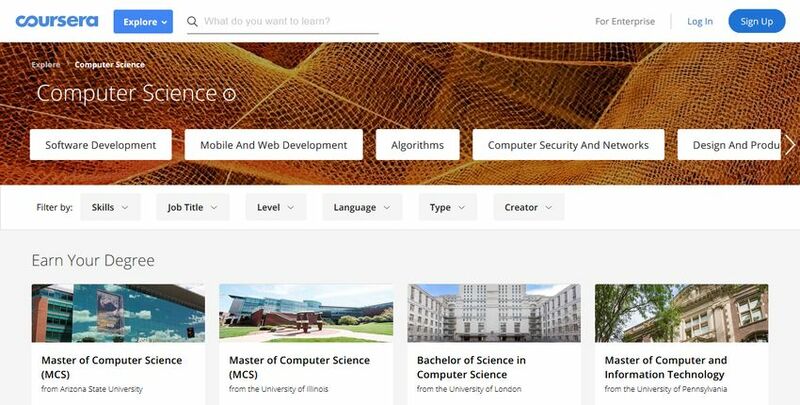 You can choose from four different paths: Computer Science, Code Foundations, Web Development, and Data Science. 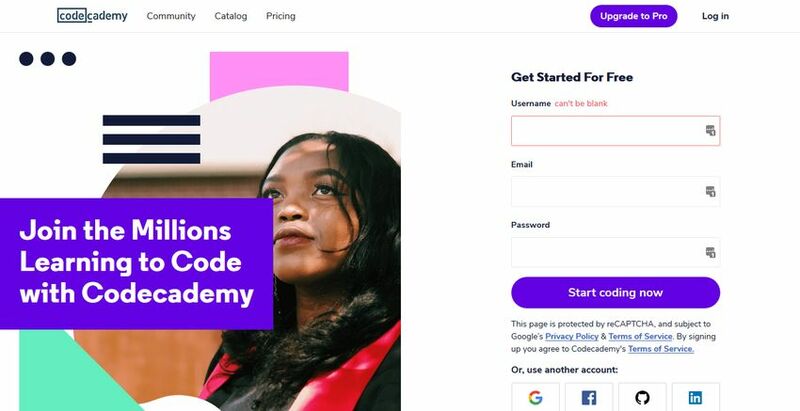 Codecademy lessons include projects, quizzes, videos, and step-by-step classes with online exercises you can accomplish using a live code editor. It also has a very active online forum where you can get an answer to all your questions. Pricing: $15.99/month with the annual plan + 7-day free trial. Udemy is a popular online learning platform where independent instructors can submit online courses in many different subjects. Courses on Udemy consist of video lectures, articles, and downloadable resources. Besides web development, you can find classes in mobile app development, game development, software testing, and eCommerce, too. Pricing: You pay on a course by course basis; courses start at $10.99. 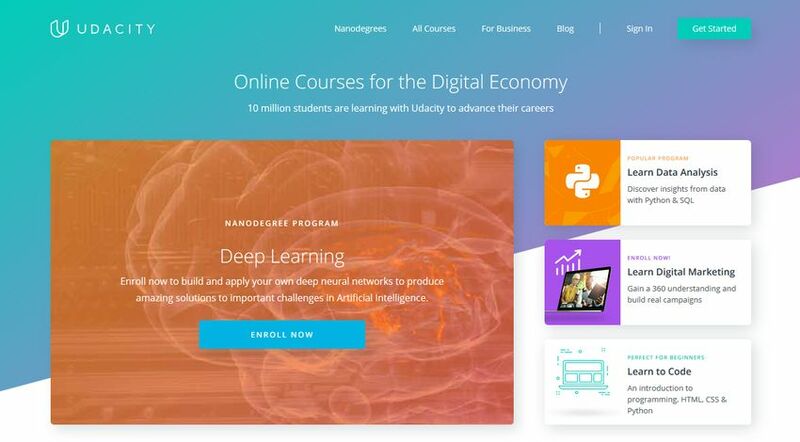 Udacity provides you with massive open online courses (MOOCs) in many different subjects like web development, robotics, virtual development, data science, and artificial intelligence. Besides individual courses, you can also sign up for nanodegrees created in collaboration with notable companies such as Amazon, IBM, Facebook, and Mercedes-Benz. Pricing: You have to pay by course; fees are decided by the course provider. Many courses are free (you can filter for free courses in the program catalog). 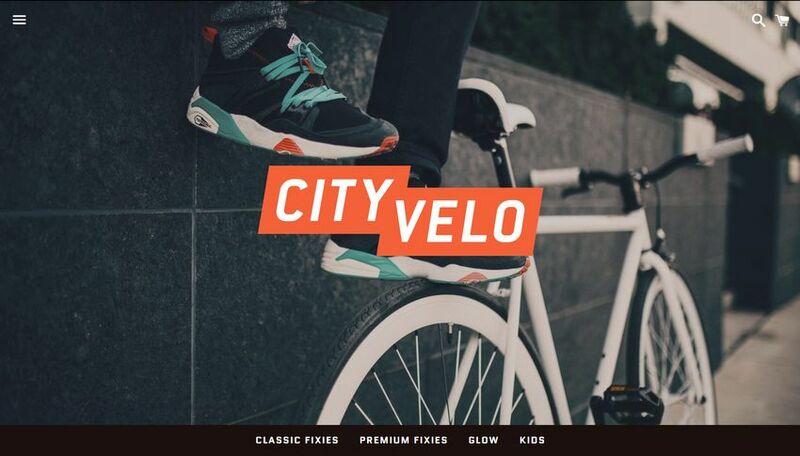 Tuts+ is part of the Envato ecosystem, together with ThemeForest, Codecanyon, and GraphicRiver. It provides you with programming and web design tutorials, ebooks, and online video courses. Video lectures and tutorials revolve around real-world examples and have been created by industry experts selected by the Tuts+ team. 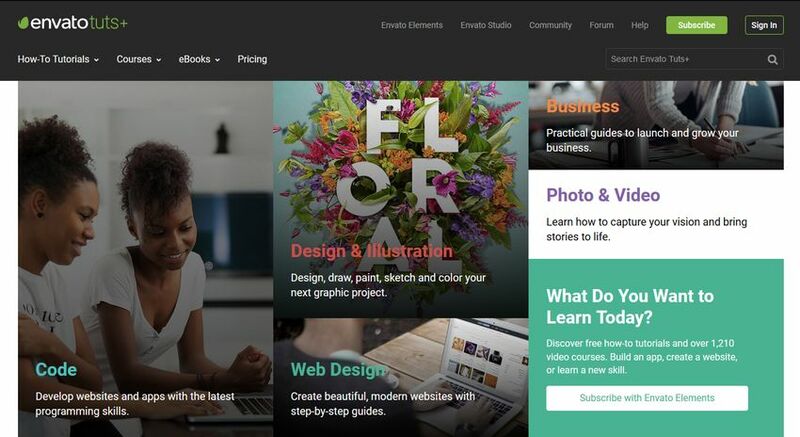 Pluralsight helps you learn how to code at every knowledge level. 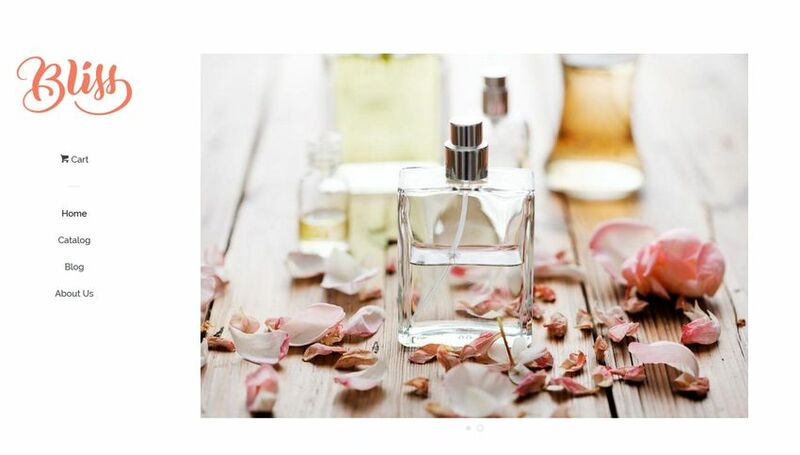 Courses are held by experienced subject matter experts. Pluralsight groups its resources into learning paths so that you can acquire a given skill set from the beginning to the end. Some learning paths also allow you to obtain a certificate, for instance, you can be an AWS Certified Developer Associate. Pricing: $29.00/month or $299.00/year + 10-day free trial. 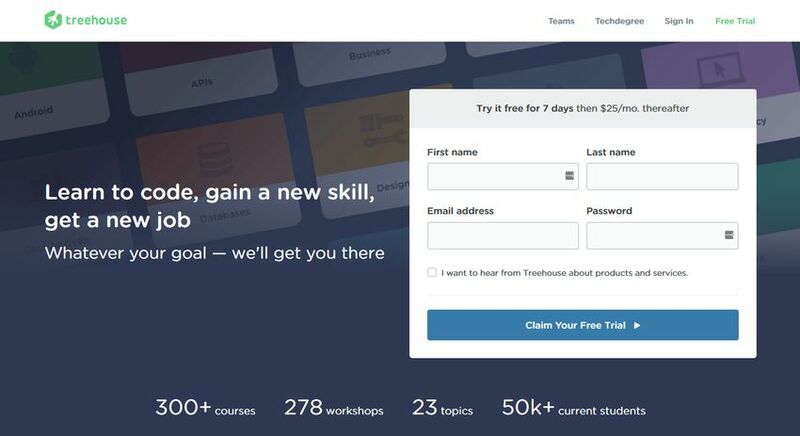 Pricing: $25.00/month + 7-day free trial. Techdegrees are available for $199.00/month. CoderByte is a web app that helps you learn how to code and practice your programming skills. The courses are made up of online video lectures you can watch for free. The most interesting part of CoderByte is coding challenges that allow you to assess your knowledge level in 10 programming languages. Although there are some free challenges, you need to purchase a membership to access all challenges, mock interview questions, and interview prep courses. Pricing: Videos are free to watch; membership subscription (that gives access to all coding challenges) costs $35.00/month. Skillshare allows you to learn a plethora of programming languages and technologies. The courses are grouped into categories like Data Science, Mobile Development, Web Development, and UI/UX Design. Skillshare courses have been created by independent content creators—many of whom are well-known industry professionals as well. Each class is a sequence of video lectures complemented with one or more class projects. Pricing: $10.00/month with the annual plan + 2-month free trial. LinkedIn Learning is a successful online learning platform that was formerly known as Lynda.com. Courses are taught by well-known experts in business, technology, and creative industries. LinkedIn Learning covers the whole technology sector. So, you get access to online video classes in web development, cloud computing, DevOps, mobile development, security, database management, system administration, and other popular fields. Pricing: $24.99/month with the annual plan + 1-month free trial. There are several excellent websites and online platforms where you can learn how to code, even for free. 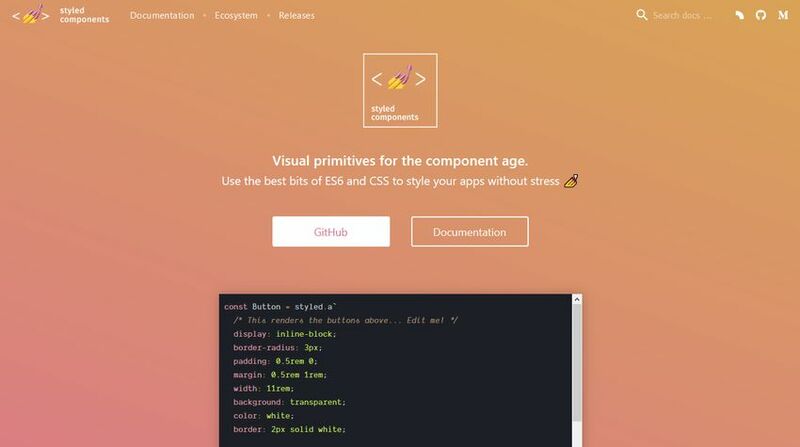 For more learning materials, check out our collection of the best learning resources for front-end developers—it includes a couple of cool cheatsheets that are worth a look. Besides having the right resources, time management is also a key concept of effective learning. So, if you have some time, also have a look at our article about the best time tracking tools.